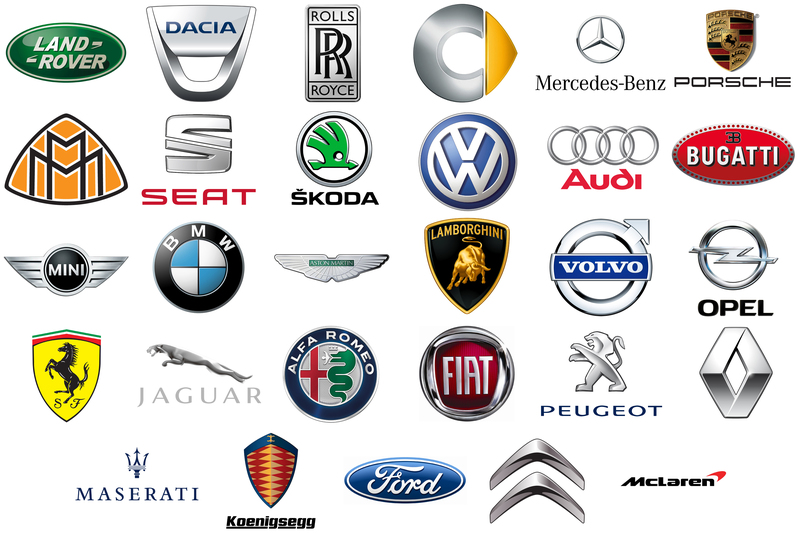 Every year, almost 20 million vehicles are produced in the EU. There are over 300 plants across Europe providing jobs for 12 million people and accounting for about 4% of its GDP. Moreover, it is auto industry that is the largest private investor in research and development in Europe (over €50 billion each year). Vehicles produced in Europe are considered the cleanest, safest, and quietest in the world. In spite of the fact that the EU is definitely a global player, in the nearest future about 80% of the growth in the automotive industry is expected to occur outside the Union. 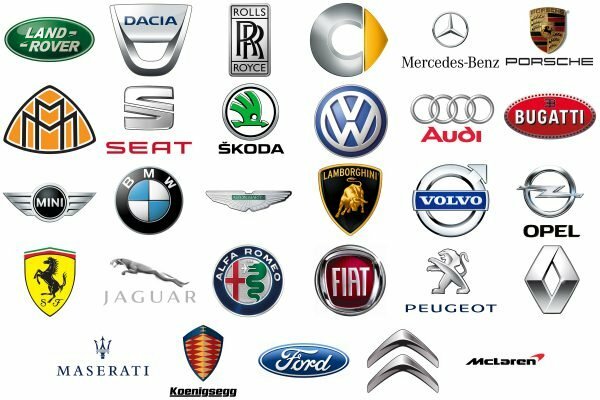 Some of the largest car makers include Volkswagen, the Renault Group, and the PSA Group, while the number of brands based here exceeds 150. The flagship brand of the BMW Group has a roundel logo resembling a propeller. Contrary to the popular misconception, this is a purely coincidental resemblance, and the roundel has nothing to do with a propeller. The BMW logo was a created on the basis of the emblem of the Rapp company using the Bavarian national colors. One more BMW Group’s brand has gone through several completely different logotypes since it was established in 1959. The current badge used since 2001 is based on the earlier versions of the logo. The name of the brand in capitals is positioned inside a circle with stylized silver wings. One of the most notable events in the automaker’s history has been the merger of four companies in 1932. It was then that the emblem with four rings was adopted. Originally, there were emblems of the four companies inside the rings. In the course of time, however, the emblems and the company names disappeared, while the interlocking rings stayed. The original 1937 logotype looked different from the current one, yet it already contained the letters “V” and “W” placed one above the other, as well as the circle theme. By 1945, the logo already acquired almost the same shape as it has today. The origins of the iconic “winged arrow” emblem date back to 1926. It is supposed to represent the head of a Native American wearing five feathers. The logotype went through a major redesign in 1994 and 2011. The logo depicts a stylized letter “S”, which is “sliced” in the middle. The innovative, futuristic look is emphasized by the color scheme comprising the red and metallic colors. A tribute to the brand’s native country, the emblem sports the colors of the German flag. The horse is used not only as the symbol of speed, but also as the symbol of the city of Stuttgart, while the background of the logo was inspired by the coat of arms of a former state, which had Stuttgart as its capital. The three-pointed star was developed as the symbol of the company’s leadership and dominance on land, on water, and in the air. Interestingly enough, originally the company trademarked one more logo, this time with a four-pointed star, but it has never been actually used. The badge created for the German manufacturer of subcompact city cars perfectly reflects its innovative spirit. It comprises the letter “C” (‘compact car’) and an arrow symbolizing moving forward. The origins of the iconic diamond shape go back to 1925. The silver color is used as the symbol of sophistication and creativity, while yellow stands for prosperity and optimism. The brand’s previous logos were based on a shield shape, which is only barely visible on the current badge. The current emblem, which was adopted in 2008, features a silver-gray trapezoid, with the brand name written over it. The lion logo made its debut on Peugeot cars in 1905. The image of the lion has undergone numerous alterations, growing more and more abstract. The company’s earliest logos had nothing to do with the “lightning bolt” emblem the brand uses now. However, the lightning bears remarkable resemblance to the depiction of a zeppelin that made its debut on the 1930s logos. 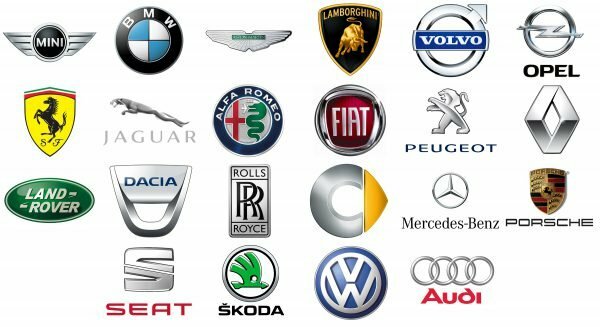 The flagship brand of the Italian-controlled multinational corporation FCA Group, FIAT has a roundel emblem with the brand name appearing against the red background. The Alfa Romeo symbol was inspired by the flag of Milan, as well as the Coat of Arms of its former rulers, the family of Visconti. The emblem, which appears to depict a dragon (or a snake) eating a human, actually means the opposite: it is supposed to symbolize a human coming out of the serpent’s mouth, purified and renewed. The Land Rover logo features the company name in white against the green background. It is placed inside an oval shape. The custom typeface has a lot in common with the Gill Sans font. The leaping jaguar logo was not the company’s earliest emblem. It was introduced only in 1945, replacing the old logo, which had been in use for a decade. The Volvo symbol is a well-known ancient emblem of the god Mars. The same symbol was used by alchemists, it represented iron. Volvo has been using this emblem since the 1920s. The logo was inspired by the prancing horse depicted on the plane of the World War I hero Francesco Barraca. It has been used by Ferrari since 1929. 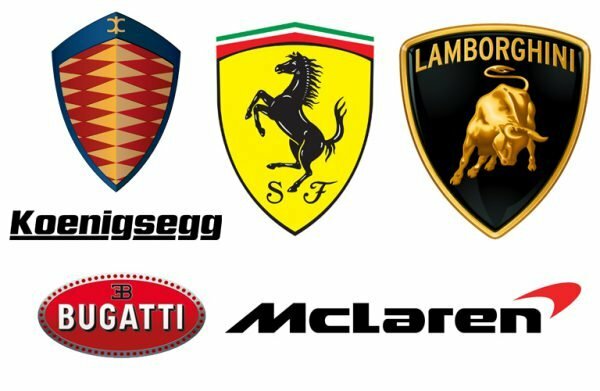 There is more than one explanation why the Lamborghini symbol is the bull. Firstly, Ferrucio Lamborghini’s astrological sign was the Taurus (or the bull). Also, Ferrucio was staying on the Miura Ranch, known for its bulls, when the idea to create his company came to him. However, legend has it, that actually Ferrucio just copied the Ferrari logo so as tease Enzo Ferrari. The logo is built around the two “R’s”, the first letters of the company name. We should also mention the mascot, which can be seen on the cars since the 1920s. The so-called Spirit of Ecstasy was based on a sculpture inspired by actress Eleanor Thornton. The Aston Martin logo features one more very popular symbol of speed and movement, a wing pattern, with the name of the brand placed over it.